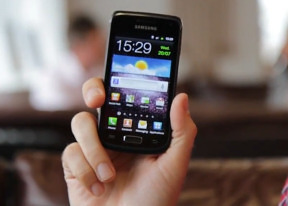 The Samsung Galaxy W I8150 runs Android 2.3.3 Gingerbread out of the box, skinned with TouchWiz 4.0. It's the latest software available, and effectively the same package as on the Galaxy S II. You get up to 7 screens to fill with widgets. The numbered dots that identify the homescreen panes serve as a scroll bar too. A press and hold on the dots lets you scroll sideways through the resized images of the available homescreen panes in one short go rather than with several swipes. The pinch zoom out is not enabled on the Galaxy W’s homescreen either due to the early software build or some hardware limitation. A press and hold on any homescreen works though (or Menu, Add) and lets you pick one of four ways to customize the homescreen – add widgets, add shortcuts or folders, or change wallpaper. In screen edit mode, widgets are docked at the bottom and scrolled horizontally. When you’ve found the one you need, it can be dragged onto the screen. It’s similar to what we’ve seen in Bada, but with some 3D eye candy. Shortcuts and folders are picked from vertically-scrollable grids. Some of the widgets can be resized just by dragging the corner much like with widgets on the MotoBLUR UI. It certainly gives you a lot of flexibility over use of screen real estate. Important widgets can be expanded to show more info, while the less frequently used ones can be made smaller to save space. The Galaxy W has four buttons docked at the bottom of its homescreen, which stay there even when you open the menu. You can remove or change them (except the home button which is fixed). The main menu consists of side-scrollable panes, much like the homescreen. You can add new pages manually, by dragging an app to a new screen in edit mode. You can add folders to the menu too – just drag shortcuts from the menu to the Make Folder icon and give it a name. Folders cannot be put inside folders and they use the icon of one of the apps inside, making them terribly hard to spot. We hope Samsung fixes that since we spent a few minutes looking for our new folder when it was right in front of us.We wish it was possible to place folders in the bottom row of four shortcuts. When the app launcher is in edit mode, you can uninstall applications (only the ones that you installed) just by tapping on them. Tapping a folder will delete it, returning the apps back to the flat menu. The notification area, one of the Android strengths, has five switches for Wi-Fi, Bluetooth, GPS, sound and rotation-lock – just like the Galaxy S II. These are always accessible (unless there’s an app running in fullscreen mode, e.g. a game). There’s the task manager too, which lets you terminate apps and clear RAM. You don’t normally need to do that since Android is pretty good at handling that kind of stuff, but power users will enjoy it nonetheless. The Samsung Galaxy W uses the standard Android gallery as every other Samsung droid. The gallery automatically locates the images and videos no matter where they are stored. It even imports the online photos from your Google Picasa web albums. Little about the Gallery should surprise you – aside from displaying full-res images and the addition of the two-finger tilt zoom, there’s nothing new, really. And don’t you worry, the double tap and pinch zooming are still there. The My Files app is a simple to use but functional file manager. It can move, copy, lock and rename files in bulk, even send multiple files via Bluetooth. My files will only browse the memory card and the large internal storage (it can’t access the system drive).